Buying the microscope that is right for you can be, at times, an overwhelming task. We’ve attempted to put as much information as possible into this site to help you make an informed decision. What are you going to use the microscope for? This is the first, and most important, question to ask yourself. Take a look below at the different options available. The modern microscope is a versatile tool which can be used for a wide variety of purposes. From clinical research at a university, to a field day in the back yard, the microscopic world is waiting for your exploration and this brief primer is meant to get you going in the right direction. As with all new endeavors, it helps to learn and apply some basic principles each time you use your microscope. That way you can maximize your results and the enjoyment of your microscopy experience. The first question to ask is, “What are you going to use the microscope for?” Do you want to peer inside the cellular structure of a living organism , or do you want to look at rocks, plants, coins, insects or other physical objects? The world of microscopy is largely broken into these two main groups, and the answer to this question will determine which type of microscope you will use. If your interest is in cellular organisms like fungus and bacteria, then your tool of choice will be the compound microscope. It’s the classic form of microscope, most often found in the school biology classroom or scientific research laboratory. It gets its name from the objective and eyepieces, the two main components which enhance, or “compound” the image magnification. Most modern compound microscopes will have either a single beam path (monocular microscope) or a dual beam path (binocular microscope) for each eye, and will generate a highly-magnified, 2-dimensional image of your specimen. The range of magnification for this type of microscope usually ranges from 40x to 1000x, although some are capable of higher or lower magnifications depending on the application. The compound microscope most frequently plays a role in the biology lab, medical clinic, or university setting. It is commonly referred to as a bright-field system, meaning it uses a conventional, visible light source to illuminate the specimen. Other more specialized applications require modified illumination based on their expected role. The metallurgical microscope, for example, is designed for the study of metals, or metallography. This microscope uses light shining down through the objective lenses onto the surface of the metallic specimen, ideal for studying grain structure, voids, inclusions and failure analysis. Polarizing microscopes are another adaptation, used when you need to image highly reflective specimens like crystals, metals, or translucent materials. In this type of microscope, a set of specialized filters are placed in the light path before and after the specimen to increase the contrast and definition of the image features. Unlike the compound microscope the stereo microscope uses two separate light paths to get a true, 3-dimensional stereo image of a small physical object. They are very useful for inspection of coins, insects, electrical components, rocks and gems, etc. Most stereo microscopes are used for magnifications from 5x to 50x, but with the proper microscope and accessories, magnifications up to 100x and higher can be achieved. In many circumstances the ability to capture, display, and preserve specimen images is of equal or greater importance than actually viewing the specimen. Digital microscopes do just that. They have built-in camera sensors which capture and transmit images viewed within the microscope onto a TV or monitor. The software which accompanies each system allows you to capture, edit, annotate and save still, full motion or time lapse images. Thanks to advances in micro-circuitry and chip design, today’s modern digital microscopes range in size from the traditional, desk-mounted unit, to models which are small enough to fit in the palm of your hand while returning crisp, live images to your computer monitor. Eyepiece – Also known as the ocular, it is the first lens you look through when using the microscope. The eyepiece consists of a series of lenses mounted on a barrel and placed in the eyepiece sleeve. It works with the objective lens to magnify the image. Objective Lens – This is the cylindrical lens positioned directly above the specimen. It creates the image transmitted to the eyepiece. Most microscopes have 3 or 4 objective lenses of different magnification mounted in a rotating turret. To increase magnification, you simply rotate the turret until the desired objective clicks into position. The Stage – The stage is a smooth, flat surface used to hold the glass slide or specimen in place. It has an opening for light to shine up through the specimen from beneath and, on most microscopes, the specimen glass remains fixed while the microscope’s objective lens and eyepiece move. Magnification – The magnification of your microscope is determined by multiplying the eyepiece power by the objective lens power at any given setting. Most modern microscopes have 10X eyepieces and 4X, 10X, 40X and 100X eyepieces, for a total magnification range of 40X, 100X, 400X and 1000X. Focusing – The focusing mechanism brings the specimen toward or away from the objective lens in very minute, controlled movements. Coarse and fine focusing are available on most models. Light – Modern microscopes have light which shines down from above the specimen (incident), light which shines up from below (transmitted), or a combination of both types of illumination. Some models utilize internal light sources and mirrors to provide direct and intense object illumination at high powers. Condensing Lens – The condensing lens takes light from the illumination source and concentrates it into a cone of light on the specimen being examined. A rotary variable-aperture diaphragm, similar to a camera iris, allows for different light intensity to strike the object. Please disregard the content below as it has been updated with the content above. The compound microscopes is the classic microscope that people think about most. It can utilize either a single beam path (monocular microscope) or a dual beam path (binocular microscope) for each eye. It will create a 2 dimensional image. The range of magnification for this type of microscope usually ranges from 40x to 1000x, although some are capable of higher or lower magnifications. The variations of the compound microscope include biological, metallurgical and polarizing. 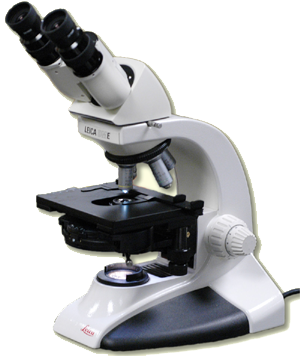 The binocular compound microscope is used when high resolution is needed. Compound means that there are two major optical parts, an objective and an eyepiece, providing magnification. Unlike the compound microscope the stereo microscopes give the viewer an (3-dimensional) image. The stereo microscope uses two separate light paths to get a true stereo image of the specimen. They are usually used for inspection and work usually involving non-microscopic activities, such as inspection of coins, insects, electrical components, rocks and gems, etc. Most stereo microscopes are used for magnifications from 5x to 50x, but with the proper microscope and accessories, magnifications up to and approaching 400x can be achieved. In many circumstances the ability to capture, display, and preserve specimen images is of equal or greater importance than actually viewing the specimen. Digital microscopes do just that. They have built in cameras. Most utilize two, the DC2 camera and the DC3 camera. Digital microscopes transmit images viewed within the microscope onto a TV or monitor. The software which accompanies each system allows you to capture and save still, full motion or time lapse images. The Stage – A smooth, flat surface that is used to hold the glass slide. On most microscopes the specimen glass remains fixed while the microscope’s objective lens and eyepiece move. Objective Lenses – Creates the image that is seen with the eyepiece. Different objective lens designs permit different magnifying powers. Magnification – The magnification of your microscope is determined by multiplying the eyepiece power by the objective lens power. Focusing – Coarse and fine focusing are available on most models. Light – Adjustable mirrors reflect the external light source onto the stage. Some models utilize built-in light sources to provide direct and intense object illumination at high powers. Eyepiece – Also known as the ocular. The eyepiece consists of a series of lenses mounted on a barrel and placed in the eyepiece sleeve. It works with the objective lens to magnify. Condensing Lens – The condensing lens concentrates light on to the specimen being examined. A rotary variable-aperture diaphragm allows for different light intensities. Buying the Right Microscope – If you’re going to buy a microscope this is the guide you want to see. Special thanks go to greatscopes.com for delivering an awesome base of information.